Below is an excellent post by my colleague, Rahul Choudaha aka Dr. Education, which I’ve taken the liberty of reposting in its entirety. Both images are courtesy of Boston Consulting Group. (The italics and bold are mine.) Note: The 2010 “per capita income” for Vietnam is based on GNP not GDP. 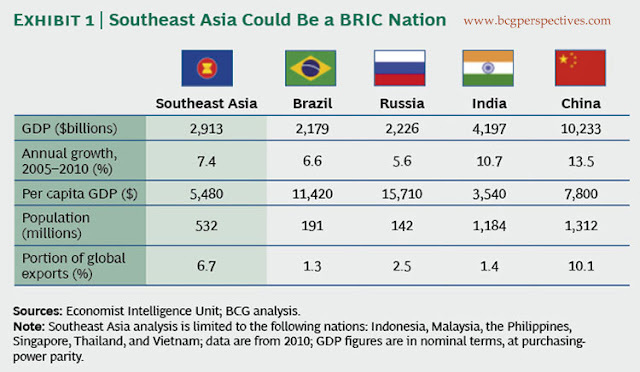 Growth of Southeast Asian economies present significant opportunities of engagement for international recruitment, collaborations and study abroad programs. A recent report by Boston Consulting Group notes that six Southeast Asian countries (Indonesia, Malaysia, the Philippines, Singapore, Thailand and Vietnam) will see nearly 100 million people entering the consumer class (annual income more than $5,000) by 2015 with consumer spending expanding by 12 percent annually. These six nations have enjoyed annual growth rates of 6 to 9 percent, although, on purchasing-power parity basis, per capita GDP in 2010 ranged from $3,150 in Vietnam to $45,170 in Singapore. This expanding consumer class will demand quality higher education and aspire for global experiences. The establishment of ASEAN Economic Community in 2015 aims to transform the region into a common market with free flows of goods, services, investment and workers. Despite its several challenges, ASEAN is expected to see greater mobility of qualified services professionals in the region. The mutual recognition arrangements (MRAs) have been signed for seven professions–medical, dental, nursing, accountancy, engineering, architectural and surveying. While AEC would keep talent mobility within the region, it presents significant opportunity for foreign institutions to offer collaborative programs in these professions.